Implant supported dentures are false teeth that are stabilized by sturdy screws that are implanted into the jaw. At the office of Dr. Thomas E. O'Connor, our St. Louis dental team uses the latest technology to plan and place implant-supported dentures and can help you benefit from this alternative to traditional dentures. Immediate dentures are permanent dentures supported by mini dental implants that can be placed in one dental appointment for patients who need an immediate solution for replacing multiple teeth. Dr. O'Connor offers immediate dentures for St. Louis dental patients who are seeking a more stable restoration in place of removable dentures. If you require tooth extraction, you can be outfitted with dentures the same day as your appointment, so you'll never have to go without natural-looking teeth. What Is Involved in Getting Implant-Supported Dentures? 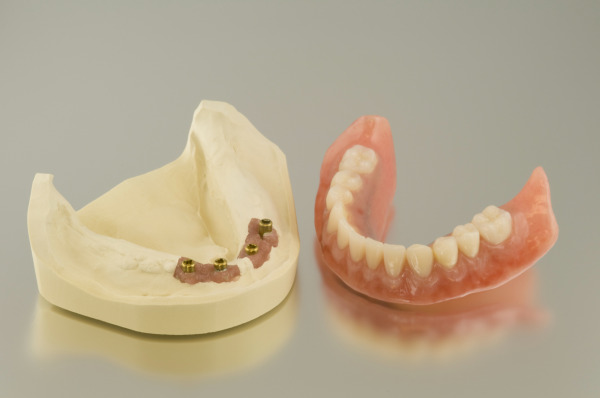 At our office in St. Louis, implant dentures are planned on a case-by-case basis. Dr. O'Connor uses 3D imaging technology to examine your mouth structure and performs a complete exam to evaluate the health of your teeth and gums. Then, he will explain the options available to help improve the function and appearance of your smile. In some cases, implant denture treatment plans will require several steps with temporary implants or gum disease treatment being needed before final implants can be placed. Your treatment plan will be developed based on your unique needs to ensure best results. In most cases, getting mini dental implants and your permanent dentures does not require time off. You will likely be able to return to work on the same day as your appointments. Are Implant Supported Dentures the Best Choice for Me? Contact Us Today! While implant dentures have helped many of our patients in St. Louis benefit from a better bite and improved appearance, there are other solutions for dealing with tooth loss as well. Dr. O'Connor can help you determine which option is best for you. To learn more, call our office to schedule a consultation.